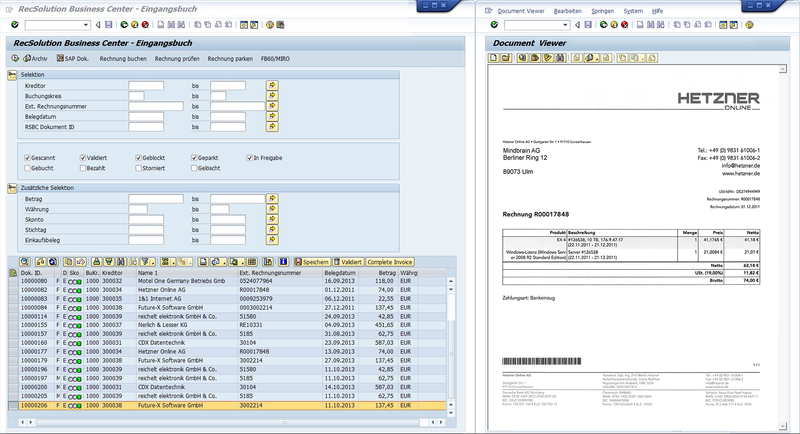 RecSolution Business Center for invoices is a complete solution for the processing of incoming invoices in SAP® ERP. It offers an integrated purchase invoice ledger for the monitoring and control of all incoming vouchers, simple and quick access to archived invoices, and the option for the direct posting of vouchers via a posting transaction of its own or via the familiar SAP® transactions. Through the seamless integration into the RecSolution intelligent recognition system, the entire processing of receiving invoices from capture up to posting and archiving of the vouchers in SAP® ERP can be automated. The aim of the automatic purchase invoice ledger is to make the capture, processing, checking, posting and archiving of all incoming invoices as automatic as possible. While RecSolution offers options for the fully automatic capture, classification and recognition of invoices and invoice data, the SAP® ERP system makes use of the required master data and transaction data that allows automatic checking and “dark posting” make possible a wide variety of invoices. RecSolution Business Center for invoices is the ideal link between RecSolution and SAP® ERP, by supplying master and transaction data from SAP® ERP to RecSolution and vice versa, it transfers invoice data and invoices to be archived from RecSolution to SAP® ERP. In addition, RecSolution Business Center for invoices offers a purchase invoice ledger of its own for SAP® ERP, in which all the incoming invoices can be monitored and checked, plus a posting dialogue of its own for the convenient manual checking and posting of invoices. The purchase invoice ledger shows all the incoming invoices in a central overview. This overview includes all the relevant information such as the invoice number, creditor, due date or invoice amount. On the basis of this information it is possible to search, filter and sort in the purchase invoice ledger. Thus, for example, all the invoices from a supplier can be sorted in descending order by due date or invoice date. Invoices that are becoming due are emphasized by a traffic light function so that all the invoices that are due for payment are visible at a glance and thus it is possible to avoid losing discounts for payment within a specified period. In order to obtain further information on a voucher, both the archived document can be displayed with just one mouse-click and to make a direct jump to the pre-posting or posting. Of course all the voucher data from the purchase invoice ledger is offered as a suggestion when jumping to the pre-posting or posting. Automatic checking of the invoice data is done in RecSolution Business Center on the basis of tax and commercial law criteria. This also allows in a further step the fully automatic posting of invoices without user intervention. In order to fully profit from the advantages of RecSolution Business Center, it is best used in conjunction with the intelligent document recognition solution RecSolution. RecSolution Business Center thus makes available via its own SAP® ERP-RFC function modules creditor and order data for the recognition process in RecSolution and transfers recognised invoice data and documents from RecSolution directly into SAP® ERP. The archiving of the invoices is done automatically by RecSolution Business Center and in conformity with SAP® ERP via SAP® ERP-ArchiveLink into a corresponding existing DMS system. Rapid and simple introduction into the existing SAP® ERP landscape by using a name space of its own and the application of SAP® ERP standards.